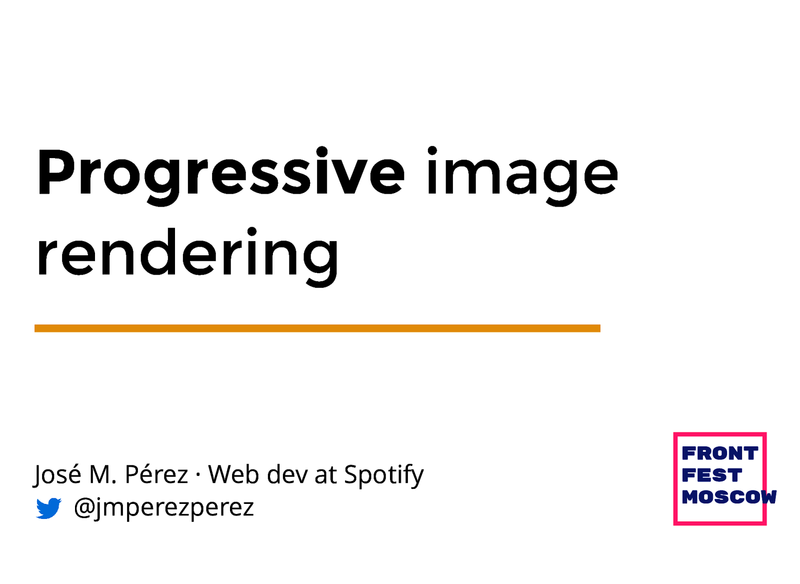 PROGRESSIVE IMAGE RENDERING @jmperezperez Привет! What will we see today? PROGRESSIVE IMAGE RENDERING @jmperezperez PLACEHOLDERS Options Nothing Placeholder Solid colour or Progressive image gradient loading or "Blur-up"
PROGRESSIVE IMAGE RENDERING @jmperezperez Summary Reduce requests Choose the right format and optimise Embrace responsive images Try to lazy load Think about placeholders Innovate! This talk addresses the culprit in page size, images. I feel that we like discussing JS and CSS and its payload, but we tend to forget about images, which represent 2/3 of the bytes of a page. The most performant request is the one that is never done, and this beats any possible image optimization. There are some common scenarios in which we can avoid using images, being adopting a minimalism/flat design or hiding certain images on smaller screens. Of course, we will need to use some images eventually. For these cases I explain how the picture element might help and some of its limitations I have found when working with real websites. One of them is lazy loading of images, which can bring great savings in terms of data traffic, but it is also easy to implement wrongly. Lastly I show some techniques to "fill" the space for an image while it is loaded, going from just showing an empty area to doing a progressive loading from a blurry image.